Gridhrasi can be equated with sciatica, where pain, weakness, numbness, and other discomforts along the path of the sciatic nerve often accompanies low back pain. It is a common affliction of adults, costing billions of dollars in healthcare and resulting in more lost days of work than any other illness but the common cold. A herniated disc, spinal stenosis, piriformis syndrome, etc., can all cause sciatica. The treatment available for sciatica in modern medicine is not very satisfactory.The role of research in Ayurveda is to elucidate the underlying principles and to explain them in modern parameters. The present study was aimed at establishing clinically the effect of Nirgundi (Vitex negundo) Ghan Vati (dried water extract) alone as well as in combination with Matra Basti in the management of Gridhrasi. A total of 119 patients were registered for the study, out of which 102 patients completed the treatment: 52 patients in group A (Nirgundi Ghan Vati) and 50 in group B (Nirgundi Ghan Vati + Matra Basti). The results show that both treatments had an effect on Gridhrasi, but there was better relief of the signs and symptoms in group B. Matra Basti and Nirgundi Ghan Vati might both contribute to different extents in the recovery of the patient. Prof Shukla was the first to introduce Nirgundi in the oral form under his guidance in IPGT and RA following work was done for joint disorder. All the scholars have reported that Nirgundi is very effective when given orally, possessing specific properties that can check the Samprapti of joint disorders such as rheumatoid arthritis and osteoarthritis. Shodhana therapy has already been established as being better than Shamana. Matra Basti in the form of Nirapada Basti can be used as an OPD level procedure level for long time without any complication. Hence, Nirgundi Ghan Vati and Matra Basti by Nirgundi Taila were selected for the present study. The Tila used for Nirgundi Taila preparation possess Vatashamaka properties. To assess the efficacy of Nirgundi Ghan Vati and Matra Basti in the management of Gridhrasi. To find a simple, effective, and cheap drug that can be used for outpatient treatment of Gridhrasi. To assess any side effect during the course of treatment. A total 119 patients of Gridhrasi from among the outpatients and inpatients of Kayachikitsa and Panchakarma Department, Institute for Post Graduate Teaching and Research in Ayurveda, Jamnagar, were selected for the study. Routine investigations were done in all cases included hemoglobin, total leukocyte count, differential leukocyte count, erythrocyte sedimentation rate, fasting blood sugar, and RA factor; routine examination of urine and stool; and x-ray of lumbosacral region (anteroposterior and lateral view). Matra Basti and local Abhyanga by Nirgundi Taila. Duration: 30 days; Anupana: with lukewarm water; local Abhyanga and Swedana: for 21 days; in three sittings, each sitting of 1 week duration, followed by a 3-day interval. Group B: Same treatment as in group A + Matra Basti with 60 ml of Nirgundi Taila for 21 days; in three sittings, each sitting of 1 week duration, followed by a 3-day interval. Out of 119 patients, 64 patients were registered in group A and, of these, 52 patients completed treatment and 12 discontinued treatment. In Group B, 55 patients were registered: 50 patients completed treatment and 5 patients discontinued treatment. Important features were as follows: 37.81% were from the age-group of 31-40 years, 64.70% were females, 91.59% were married, 91.59% were Hindus, 57.96% were housewives, 97.95% were from urban areas, 22.68% of the women were of menopausal age, 24.36% of the women had history of caesarean delivery, 60.48% were Vata-Kaphaja type, 39.48% were Vataja type, 39.48% had Vata-Pitta Prakriti, and 33.60% had Pitta-Kapha Prakrii. Among Nidana, 54.6% had Mithya Ahara, 45.36% had Katu Rasa Sevana, 38.64% had Ritu Viparita Ahara, 57.96% had Vishamacheshta, 18.48% had Aticheshta, 12.70% had Bharana, 11.99% had Abhighata, 45.36% had Chinta, 26.88% had Shoka, 45.36% had habitual constipation, and 21% had obesity. Cardinal symptoms of Ruk, Toda, and positive SLR test were found in all the patients (100%). Aruchi was seen in 74.76%, Gaurava in 46.2% Tandra in 29.45%, Spandana in 25.23%, and Dehasyapi Pravakrata (functional scoliosis) in 18.48% patients. In Dushya, involvement of Kandara-Sira-Snayus was found in 88.37%, Rasadushti in 81.39%, Raktadushti in 34.88%, Mamsadushti in 27.90%, Medadushti in 30.23%, and Asthi and Majjadushti in 39.53% of patients each. Both groups showed improvement, but group B showed better results in the chief complaints and also in the neurological findings. In group B there was relief in Ruka (62.20%), Toda (63%), Stambha (71%), SLR test (56%), and walking time (59.82%). We assessed the effect of therapy on Dosha involvement: In group A, relief in Vataja Gridhrasi was 28.84%, while it was 71.15% in Vata-Kaphaja. In group B, relief in Vataja Gridhrasi was 44%, while it was 56% in Vata-Kaphaja. Among the two groups result effect of therapy was found better in Vata-Kaphaja type of Gridhrasi and were better having chronicity less than 1 year in both groups, where most patients 68% were from group B. The chi-square test showed good improvement (statistically highly significant; P<.001) in parameters like Ruk, Toda, and walking time in both groups; the improvement in Spandana was also significant (P<.01). Treatment did not produce significant improvement in any of the other symptoms. When the total effect of therapy is considered, treatment with Matra Basti was slightly better than Nirgundi Ghana Vati, though the difference was statistically nonsignificant (P>.05) [Table 1]. Among the study subjects, 37.08% were in the age-group of 31-40 years and 32.77% in the age-group of 41-50 years. Thus, the 4 th decade of life appears to be the initial stage of Vata Prakopa. According to modern science, there is progressive decrease in the degree of hydration of the intervertebral disc with age, leading to the cycle of degeneration. Hence, the prevalence of sciatica is high in middle-aged people. This theory is supported by the present study. Most of the patient's (97.5%) were from urban areas; this is because of fast lifestyles and hazards associated with industrialization. A large proportion of the patients (57.96%) were housewives. Household work involves working in abnormal posture for long periods and so there is much wear and tear and higher loads on their spine. Labourers too show relatively high prevalence (8.4%) because of the heavy work they do. Bad posture, standing, forward bending, long walking, constant sitting were the aggravating factors in 80% of patients and a constipative diet in 45% patients. A high proportion of patients (39.48%) had Vata-Pittaja and 33.60% had Pitta-Kaphaja Prakriti, while the rest (25.20%) had Vata-kaphaja; this suggests that Vata plays a major role in the manifestation of Gridhrasi. In Nidana, 58.8% had Katu Dravyatisevana; ingestion of food which are Ruksha, Sheeta, Laghu; Ratri Jagarana; Vegavidharana; and all such factors that lead to Dhatu Kshaya and Vata Prakopa. Vega Sandharana (found in 19.32%) and Vishama Cheshta (in 57.96%) may be precipitating factors of Gridhrasi as they cause strain on the spine. History of Abhighata was found in 11.99%, which indicates that the presence of a prior Kha-Vaigunya increases the incidence of Gridhrasi. As much as 45.36% of patients had Mansik factors such as Atichinta, which reflects the role of tension in Vata Prakopa. History of cesarean delivery was present in 24.36% of the women; possibly epidural anesthesia adversely affects the lumbosacral area. Among the female subjects, 22.68% had reached menopause, indicating that degenerative changes occur earlier in relation to male. Twenty-one percent of the women were obese; excessive pressure is exerted on the weight-bearing joints such as the lumbosacral joint, and the nerves originating from this area were affected. In x-ray findings, 10.08% had spondylosis and osteoporosis, 5.04% had sacralisation, 9.49% had spondylolisthesis at L5-S1, and 5.04% had Schmorl's node and lumbar canal stenosis, where the spinal canal narrows and compresses the spinal cord or sciatic nerve roots. Patients with normal x-ray findings were included under piriformis syndrome. 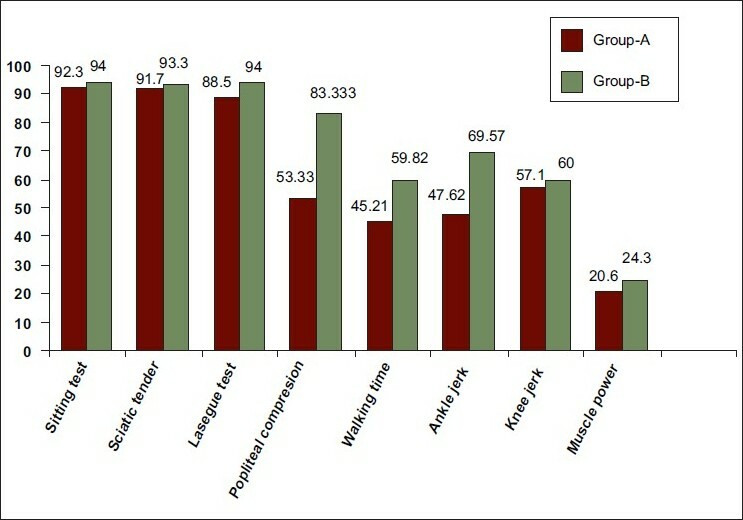 Effect of therapy: Improvement of pain and Toda was more in group B (62.19%) in comparison to group A (38.69%). Pain is produced mainly by Vata Prakopa, and Basti is the best treatment for Vata. Usna Virya of Nirgundi and Til-Sneha act synergistically to reduce pain and hence the better relief in group B. The analgesic and anti-inflammatory action of Nirgundi can be attributed to its flavonoid content, which are known to act through inhibition of prostaglandin biosynthesis. Toda: This shows that nearly half of the patients who have disturbed Nidra by Toda as night is Vata Prakopaka Kala, so Toda might be aggravated during this Kala, group (group B) showed better improvement in Toda (62.90%) than group A (45.03%). Matra Basti acts as Vataanulomana and relaxes the spinal muscles controlling Apana Vayu. Spandana occurs due to Vata and is better relieved by Matra Basti. Comparative relief in neurological findings (SLR test): Sakthikshepanigraha was measured by the SLR test. In group B, Nirgundi Ghan Vati and Matra Basti provided 55.97% relief, which was statistically highly significant (P<.001). (Dehasya Pravakrata) Group B showed better (60%) relief than group A (P<.001) [Figure 1]. With Matra Basti, all the patients were able to lift the leg higher due to reduction in muscular spasm. In group B, walking time were relieved (59.62%) and jerks (68.75%) better than group A [Figure 2] may be due to Vatkapha Shamak properties, Snigdha decrease Rukshta of Vata and Vasti may help in breaking the Sanga and Margavrodh. Group B showed better results in the chief complaint and the neurological findings, as Matra Basti may be helping in controlling both Vata and Kapha and breaking the Samprapti. Effect of therapy on Dosha involvement: In group B, Vataj types result was statistically highly significant (P<.001) with relief of 56%; this was possibly due to the Vatahara effect of Sneha-Basti. Effect of therapy on Dushya involvement: In group B, statistically highly significant result was found in the improvement of symptoms of Dushti of Rasa, Mamsa, Asthi, Majja, and Kandara-Sira-Snayu and significant result was found in the Dushti of Rakta and Meda in comparision to group A, proving the effect of Matra-Basti in combination with oral Nirgundi Ghan Vati. 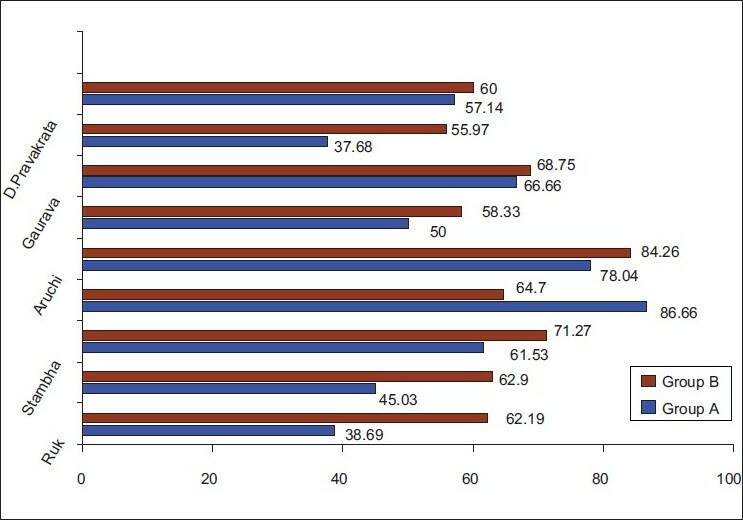 The overall effect of therapy is shown in [Table 2]. The therapy on follow-up showed that maximum number of patients (70.56%) had no recurrence of symptoms during the period of follow-up of 1 month. Recurrence was more common in group A than in group B, which shows that the combination of the oral drug and Matra Basti provides better radical cure. Due to the presence of Nirgundi Taila, Matra Basti can be considered as Laghu, Snigdha, Ushna, and Tikshna, having Vata-Kapha Shamaka action that antagonises Kapha and Vata. Taila Snigdha Guna antagonises Ruksha of Vata and Tikshna Guna helps in removing Srotodushti due to 'Sanga' [Table 3]. Hence, Matra Basti directly pacifies Apan Vayu, restoring equilibrium of Agni which controls both Samana Vayu and Pran Vayu. Just as destruction of the roots kills a plant, Vasti administration destroys disease. Moreover, Basti is best for Vatavyadhi also for Asthi Gata disease Vasti and Tikta drug is beneficial. Asthi being the site of Vata and Vasti materials purify the Purishadhara Kala. Asthi Vaha Srotas may be purified, and vitiated Vata get subsided. Pakwashaya, in the main sites of Vata and Basti drug, i.e., mainly Sneha, possesses Vata Shamaka property. Here, it is noteworthy that the Nirgundi oil, used for Basti, possesses Vata Kapha Shamaka properties due to Ushna Virya, and thus suppresses the disease. Both treatments have effect on Gridhrasi. Although Nirgundi Ghan Vati showed good results, Nirgundi Ghan Vati with Matra Basti provided better relief of the signs and symptoms. Nirgundi is cheap, easily available, free from controversy, and very effective in joint disorders. 1. Braunwald E. Harrison: Principles of Internal Medicines. 15 th ed. McGraw-Hil Medical Publishing Division; p. 73. New York, 2001. 2. Charaka Samhita, Shastri SN. Vidyotnini hindi commentary, Varanasi: Chaukhambha Academy; 1998. p. 54-6. 4. Ibid Charak Samhita,Chikitsa sthana, 28/134-135. 5. Rao TB. Methods of Biostatistics. 2 nd ed. 2004. p. 127. 6. Kumari A. A Comparative Study on the Effect of some Indegenous compound drug and Matra Basti in the management of Gridhrasi. p. 56. M.D. (Ayu.) thesis, Institute for Post Graduate Teaching and Research in Ayurveda, Gujarat Ayurved University, Jamnagar. 7. Pandey G. Dravyaguna Vijnana.1 st ed. Varanasi: Krishna Das academy; 2001.p. 716. 8. Dharmasiri JR, Jayakody AC, Galhena G, Liyanage SSP, Ratnasooriya WD. J. Ethnopharmacol. 2003;87:199-206. 9. Mahto RR. A Comparative Clinical Study of Nirgundighanavati and Matra Basti on Amavata; p. 214. M.D. (Ayu.) thesis, Institute for Post Graduate Teaching and Research in Ayurveda, Gujarat Ayurved University, Jamnagar. 11. Sushruta samhita. Shastri AD. 11 th ed. Varanasi: Chaukhambha Academy; 1997. 12. Sneha. Indian express- hazard of X-rays. Eye; 2009. p. 6.